But it'll cost $50 more on Sprint. Andy Rubin’s Essential phone—you know, the other upcoming handset with the camera notch at the top of the screen—is now more than 30 days past its original shipping deadline, but we still don’t have a solid release date. However, a Best Buy listing suggests it could turn up at any moment. 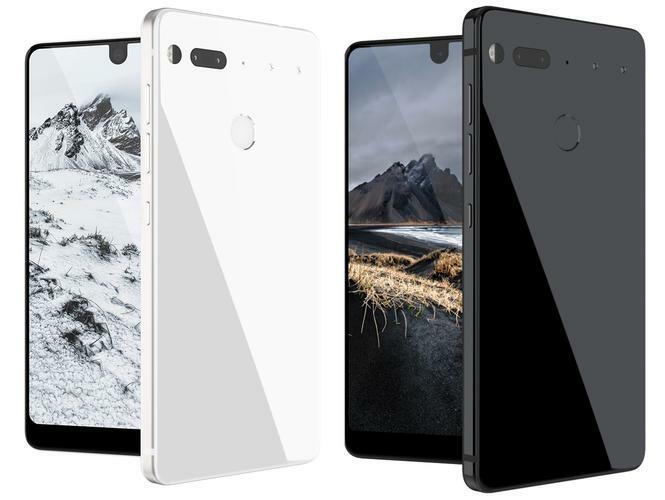 As first spotted by Android Police, Best Buy has posted four listings for the Essential phone (PH-1), two each for the Sprint version (black and white) and the unlocked version (black and white). Those are the same two color options available during pre-orders on the Essential site, with gray and a bluish “ocean depths” options coming later. Essential facts: Andy Rubin’s new company has had a rough start. First it missed the shipping deadline for its first phone, and then it was reported that three top executives, including its head of UX and former Pebble, WebOS designer Liron Damir. So, the company could use some good news, and a release before the Galaxy Note8, LG V30, and iPhone 8 dominate the headlines would certainly fit the bill. Soon that camera cutout can be all yours. 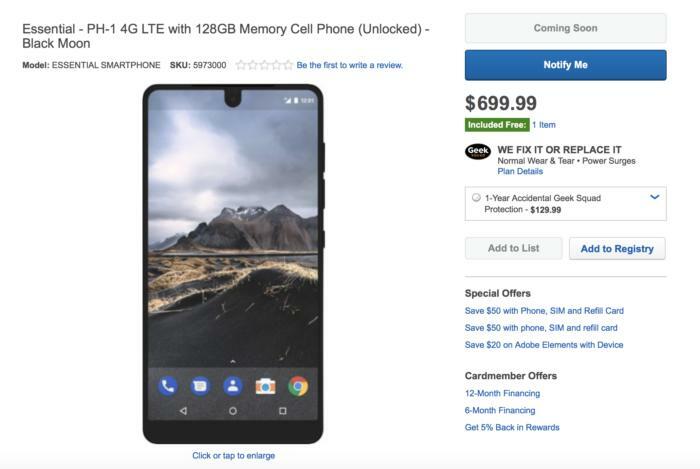 According to the listing, the unlocked model will work with AT&T, Cricket, Go-Phone, H2O Wireless, Net10, Simple Mobile, Sprint, T-Mobile, TRACFONE, and Verizon, though it seems that Sprint has exclusive right to sell the handset in it stores. Best Buy also confirms that the phone will ship with Android 7.1, though it’s unclear if it will be running the latest 7.1.2 version. Elsewhere, the specs of the phone are unchanged from what we already know: a 5.71-inch Quad HD screen 2560 x 1312 screen, Snapdragon 835 chip, 4GB of RAM, a 3,040 mAh battery, and a 128GB hard drive. Unfortunately, the listing only says “coming soon” with no preordering option, though you can sign up for notifications to be among the first notified when it goes on sale. On July 21, Rubin said the Essential phone (PH-1) is slated to hit shelves “in a few weeks,” which would put a potential release around Aug. 11. The phone costs $700 unlocked and $750 through Sprint for some reason, even though the specs of the two phones are identical on the site. Included with your purchase for an unlocked is a cheap Insignia universal cell phone stand valued at $10.